Does the WeeRide meet Australian Safety Standards? There are NO Australian standards in existence for centre mounted child bicycle seats. The only Australian standard is 14 years old and specifically relates to rear mounted seats. A respected cycling-specific engineering firm performed an independent analysis of the WeeRide and concluded that the WeeRide (or centric-safe haven as it was called) is far safer than a rear-mounted seat. 1.) Better balance – the weight of the child is between the two wheels of the bike. 2.) More control over the random behaviour of a toddler – with a WeeRide the child is in front of you in your normal line of sight so you can control/prevent/proactively take action. 3.) The child is more engaged in the ride – unlike in a rear-mounted seat, the child does not have to sway in their rear-mounted seat to see past you. The child is less bored and less tempted to cause trouble by accidentally dropping or even throwing things. 4.) It is virtually impossible for the child to put feet, hands, shoes, dolls into a wheel - since they can't reach and you'd see it happening! 6.) In a rear-mounted seat you spend a large amount of your time worrying about what is happening behind you rather than concentrating on what is happening in front of you - that cannot be safe. There is a bone of contention is around what actually would happen in an accident, with pro-rear-mounters saying the child would take the first impact in a WeeRide - whereas you, the rider, can be a crumple zone for a rear-seat - and the pro-WeeRides saying, well at least I can get my arms around them....all speculation, no data exists! Safe to say with either type of seat in an accident there will be no winners and since prevention is far more effective the WeeRide wins hands down. Let me explain my personal position. I rode today (Jan 2008) and dropped my 40 month old daughter at childcare. I've ridden with both rear & front mounted seats. If I felt a rear-mounted seat was better, I would use it. This isn't a commercial line - I started out using the WeeRide as a customer just like you. I did 18 months of riding with my daughter in a WeeRide and thought it was such a great design that I obtained the rights to import them. There are two legally mandated standards that apply to bicycles in Australia being "AS/NZS 1927:1996 Pedal Bicycles – Safety Requirements" and "AS/NZS 2063:1996 Pedal cycle helmets" (detailed here - http://www.rcta.org.au/index .php?option=comˍcontent&task =view&id=32&Itemid=41).Neither of these apply to bicycle child carriers. Obviously a WeeRide is not located forward of or on the handlebars - so is in compliance with this too and we can not find any state-specific legislation that WeeRides break. There are also voluntary standards, created for commercial reasons by the privately owned company Standards Australia and this is where the confusion seems to arise. 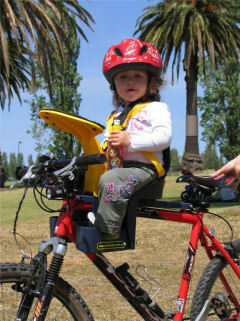 There is one for bicycle child carriers ... AS/NZS 4287:1995 Child carrier seats for pedal bicycles—Safety requirements . This was formulated in 1995 well before the WeeRide was invented and is only for rear-mounted seats. The WeeRide complies with all of the voluntary requirements such as quality of build, strength of attachment to the bicycle and so on ..... but a Weeride is not rear mounted and therefore cannot claim to fully comply. It's interesting to us that many bicycle stores that don't stock WeeRides will often mention this Standards issue as if WeeRides are some how illegal (obviously they are not) or death-traps (WeeRide is the biggest selling Baby Bike Seat on Amazon.com - does anyone imagine for a second Americans wouldn't have sued somebody into oblivion if the seat was in the slightest bit unsafe?) and yet the store will sell Trailers or Tagalongs - for which NO standard exists..... go figure! We have spent hours trying to engage with the privately owned/run Standards Australia to have their outdated standard updated - by their own guidelines and admissions this should have happened when the standard was 10 years old. They admit that the subject of child seats is on their list of things to do, but it is a very low priority. And the reason for this -- is that WeeRides , Tag Alongs, etc are not the source of problems -- so they concentrate their efforts on more dangerous things. How hard is it to install a WeeRide? Installation should only take around 10 minutes. YES, IT SHOULD FIT ALL STANDARD BIKES. The WeeRide is designed to fit a wide range of bikes, including those with oversized head tubes and is the only bike seat to fit on full suspension mountain bikes. bikes with a frame under 16"
What bikes does a WeeRide fit? The seat fits bicycles with 610mm and 640mm wheels and almost all styles - including Ladies Bikes, Mountain Bikes, Hybrids. What bike doesn't a WeeRide fit? Bikes a WeeRide certianly won't fit on include serious downhill/free-riding mountain bikes - with enormous front suspension - very very unlikely you'd want to a put a WeeRide on one anyway. Bikes you probably shouldn't fit a WeeRide on include Racers with drop handle bars - the riding position is more aggresive, bars are narrower and getting to the 'drops' where the brakes/gears are is difficult. Can I mount a WeeRide on a mountain bike with cable on the handle bars? The first bike that we put a WeeRide on an was Apollo LSX 1.2. Don't use the bike anymore - but happily rode with our daughter for well over 2 years on it. Although it's hanging on the wall now - but as you can see it's cables run along the top. So I'd say yes - it will fit. In fact you used to be able to see our daughter on the home page of http://weeride.com/ sitting on the seat of that bike - they've changed the photos now. Can I easily remove the WeeRide from my bike? You can remove the child carrier itself from the steel support bar quite easily - it is attached by a single thumb screw - for putting the bike on a carrier, or if you wish to ride without the carrier. 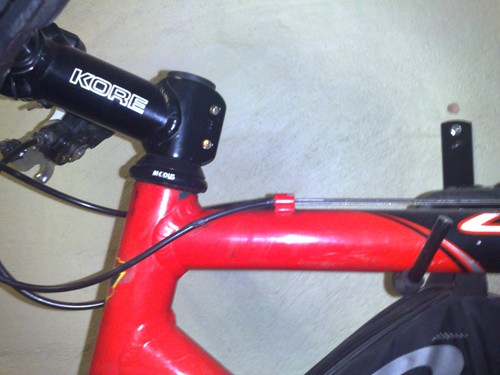 The bar on which the carrier is mounted remains on the bicycle and does not interfere with normal riding. Will my knees bump into the seat when I ride? BUT you do need to alter your riding style slightly to accommodate for the WeeRide. I've surveyed my customers twice - and have specifically asked them about this - on a scale of 1 to 5 (5 being totally, 1 being not all at) people agreed that the WeeRide is a 2 of 5 (slightly) for leg position, and a 1 out of 5 (not at all) for arms. In both surveys I also asked customers - given this and knowing what they know now - would they prefer a WeeRide or a rear-mounted seat - in both surveys - 100% of customers wouldn't swap the WeeRide! I would be stunned if the pleasure of riding and interacting with your little one isn't 1000 times better than a slight leg adjustment. Is the seat belt similar to a child car seat? AND does it fit around their shoulders and how tight can they be strapped in? Children who have mastered the art of wriggling off the shoulder straps and clipping their car seat have been unable to get out of the WeeRide harness. Why is there a symbol of the WeeRide rear mounted on my model? "Well, it is very funny. We have had that marking on the child seat for years and no one ever asked why. The correct reply is that it should not be there at all and it will be eliminated completely. " What happens if my WeeRide won't fit my bike? If you purchase a seat and it does not fit a bicycle with the aforementioned specifications, please return it to the point of purchase for a full refund. Is there a weight, age or height limit? The seat carries a maximum weight of 40 lb./18 kg and about 12 months old (must be able to hold their head up). The official weight limit is 18kgs. The limit was set so low because most front bike seats attach to the handlebars, and putting weight on to your handlebars such as the Ibert, Bobike etc, is dangerous. In reality, you could fit a child of a much larger weight on a WeeRide, as the weight is out centrally due to the patented bar. We put an estimated age limit of 4 as this is when their legs are too long to use the seat. The only constraints on the height of a child is that their knees must fit under the handlebars. Small 7-year olds have been accommodated by the seat. Where is the WeeRide manufactured? For quality reasons the WeeRide seat is currently made in Portugal and the support bar in Taiwan, the box and labels are printed in China and then the whole lot assembled in America and Australia! Of course this may change in the future. The WeeRide itself is a Canadian patented invention. How much does the WeeRide weigh? Installed weight is just over 7lbs/3.2Kgs.